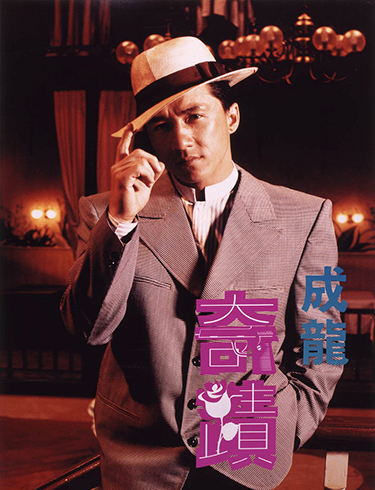 Inspired by Frank Capra’s 1961 film Pockeful of Miracles, Jackie Chan plays Wah, a country boy who moves to the big city and through a string of lucky events, manages to become a successful crime boss. He attributes all his success to the luck he gets from the roses he buys everyday from an old woman, Madam Rose (Gua Ah Lei). Vowing to do more good deeds, Wah gets the chance when Madam Rose’s daughter comes to town with her wealthy fiancé. Fearing her poverty will bring disgrace on her daughter, Wah helps Madam Rose. In the midst of a gang war, and being perused by police, Wah aids Madam Rose through an elaborate deception in order to ensure her daughter’s smooth engagement.